Are you considering buying your first house but feeling a little lost and caught up in everything? 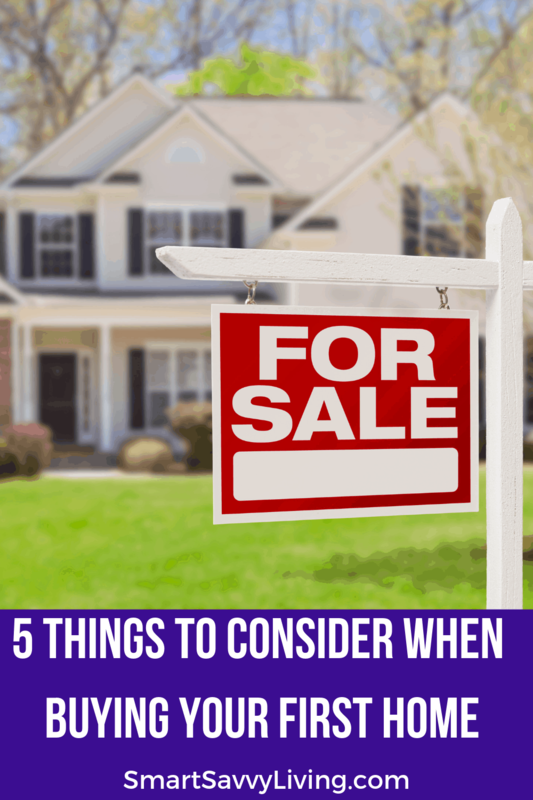 Check out these 5 things to consider when buying your first home. Buying your first home can be a time of both excitement and fear. The thought of having a place to truly call your own is the dream of many. But, thoughts of “Can I really afford this?” or “Will I find the perfect home?” along with many others pass through your mind. However, we’ve learned it doesn’t have to be an overly stressful time as we research buying our first home. 1. Know how much you can comfortably afford. If you’re considering buying a house, you’ve hopefully already got a budget setup. You need to know how much you can afford to comfortably pay monthly for where you live and have savings or another plan in case you lose your job or get hurt. You don’t want to end up house rich but everything else poor. For example, when I got sick last year we used up most of our savings. When our landlord wanted to sell the house we were renting, it was tempting to see if we could buy a house instead of finding somewhere else to rent. We knew that things were just too tight to take on home ownership at the time though, so we decided to rent at least a couple more years to get things built back up. As a renter, it can be tough to take into consideration all the extra costs that come with owning a home. Yes, there are tax deductions, but those take a year to roll around. Maintenance – landscaping, unexpected home and appliance replacement and repairs, etc. If you don’t have money set aside for these things, it can be quite the sticker shock once a bill arrives. Insurance generally costs hundreds of dollars and property taxes can be thousands of dollars a year. It’s also important to realize that you’ll still be paying property taxes after you pay off the home. Some locations have taxes that are a lot higher than others and is something to take into long term consideration. If you have a decent down payment set aside, you may want to look at saving some of that money for home emergencies that aren’t currently visible and maybe invest in mortgage insurance. Mortgage insurance basically means you can purchase a home with less than the traditional 20% down payment as it provides financial protection to lenders and investors if a home buyer ends up defaulting on their loan. It can often lead to faster closings. Plus, once you’ve built up 20% equity in your home with a good payment record, you can generally cancel the insurance. 2. Be aware of association rules and local laws. More and more communities are starting homeowners associations which can contain a number of rules homes in the community must abide by, in addition to extra cost. You may have to keep your home landscaped a specific way. You may not be allowed to have certain breeds of pets. Your trash cans can only be visible at certain times. There may be regular inspections of the exterior of the home. Many cities and counties also have specific laws about the number of pets and specific breeds, extra taxes, and other specific ordinances that you want to be sure aren’t deal breakers before purchasing the home. 3. Know what is near the home. You have found the perfect home and are eager to make an offer, until you hear the jet fly above you. You can’t wait for your children to enroll in the fabulous school just across the street until you realize how clogged the roads are and that you really can get tired of hearing the marching band. You love that your new home will be near your favorite Italian restaurant until you realize you can smell garlic all. the. time. Being close to a hospital is reassuring until you’re constantly woken up by sirens. The nearby open fields may look lovely until you find out a strip of townhomes is being built there. All of these and more should be taken into consideration before making a final offer. 4. Get a thorough home inspection and see if you can get records on past improvements. While you may be able to get a better deal on buying things “as-is” I am always wary of doing so, especially with something as expensive and long-term as a home. You never know if there may be foundation issues, hazardous electrical issues, or other issues so I think it’s always a good idea to get a thorough home inspection before closing. This will help you make sure of any potential deal breakers you may not be able to afford or the seller may not cover. While some sellers may not be willing to do so, it may be a good idea to see if the seller is willing to give you information on past improvements. What materials were used when the bathroom was renovated, when was the roof last replaced, etc. This will help you get a feel for when you may need to invest in further improvements. 5. Try to not get so emotionally invested that you can’t say no or walk away. You may want to roll your eyes at this last homebuying tip. But, it’s actually really easy to do if you see a home that you think is perfect for you to the point that you immediately start seeing yourself living there with how you would decorate and make it your own. You never know what may be brought to the table or deal breakers that may surface. The seller may not accept your offer, or another gets accepted before you decide. The seller may not be willing to cover repairs that are needed, or you later find out something before closing that you’re not sure you can compromise on. There are simple things you should be able to compromise on, such as a fresh coat of paint for new wall colors or different flooring. However, try to not get so emotionally invested that you feel like you can’t walk away even when you know it’s something you really can’t afford or want to deal with. On the flip side, if you get turned down, you don’t want to be so heartbroken that you end your search. As you can see, buying your first home is much more than just having enough money in the bank. Money is important too though – so that’s why you should take control now and start planning for tomorrow! If you’ve already bought your first home, what’s some advice you can give for things to take into consideration? Thank you for these great tips, Michelle! I especially like your last one! We had a couple of offers fall through before we were able to buy our current home and it was really hard. Not getting too attached right away is really solid advice!! Thanks, Layne! We were actually discussing this the other night about how getting too attached can make you spend more money than you really need to when there are so many other houses out there right now.